The confirmation of British Visit by India's Prime Minister Shri Narendra Modi has been greeted by such a joyful and eager await by the high population of 1.6 million diaspora Indians in Britain. Hindi news channels have spread the news far and wide attracting massive audiences across the globe. This will surpass all receptions by the major countries he has visited in the past in that it will not only be a big reception in scale but it will be intermingled with other cultural festivals such as the Diwali and probably the largest fireworks display the United Kingdom has ever held. It will be held in the Wembley stadium which has a sitting capacity of 90,000 people. Live India News channels will cover the cultural festival. British Prime Minister David Cameron is said to have a warm relationship with the Indian Prime Minister. Cameron has visited India 3 times in the last parliament and is honored to host Narendra in Britain as claimed by Priti Patel, the highest Indian official in the British Government. She said this in an interview by the Indian Times. "As a key person working with a wide range of community organizations and stake-holders to bring this event successfully here, I am not at all surprised by this perfect sell-out that is taking toll at Wembley Stadium given the enormous size of the Indian community here in Britain and the UK as well," Patel told the Hindi news channels. 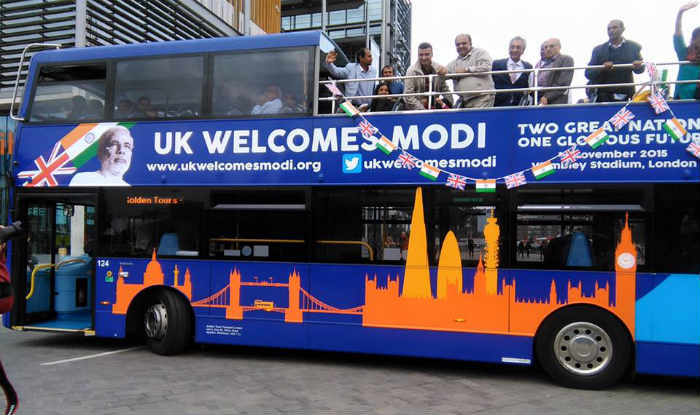 This much Emphasis on Shri Narendra Modi's visit is due to the fact that he was in 2002 banned in the UK in connection the Gujarat killings. He was however acquitted by the Supreme Court of India in 2012 and later his ban was disregarded as he rode to power in 2014. Ever since he came to power Britain has been trying to get him to visit the UK without much success. There is also a possibility that Narendra Modi will meet her majesty the Queen. Top sources In the Government claim that they are working hand in hand with the Indian foreign office to confirm the meeting. The agenda of Prime Minister Modi's visit is to strengthen ties between India and the UK as well as deepen existing bonds in business, education, culture, security and so much more. Prime Minister Shri Narendra Modi is set to visit Britain on the 12th and stay for three days then leave for the G20 Summit which will be held in Antalya, turkey on the 16th and 17th of November 2015.